He issued warning on all labor attachés especially to the five being sent home to act on OFW issues or face recall. 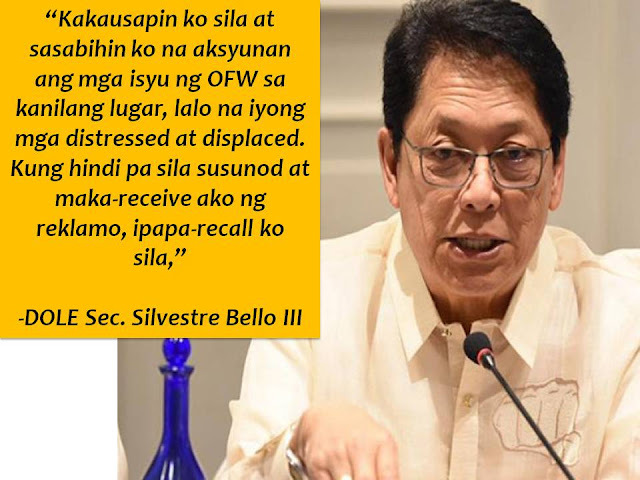 Bello said in a statement that the five were instructed to report so that they can answer personally on what they are doing on the critical issues of OFWs in their areas of assignment. “I will talk to them and will order them to act on the issues concerning OFWs in their areas of jurisdiction, especially distressed and displaced OFWs. If they will not heed my order and I receive complaints, they will face recall,” he added. 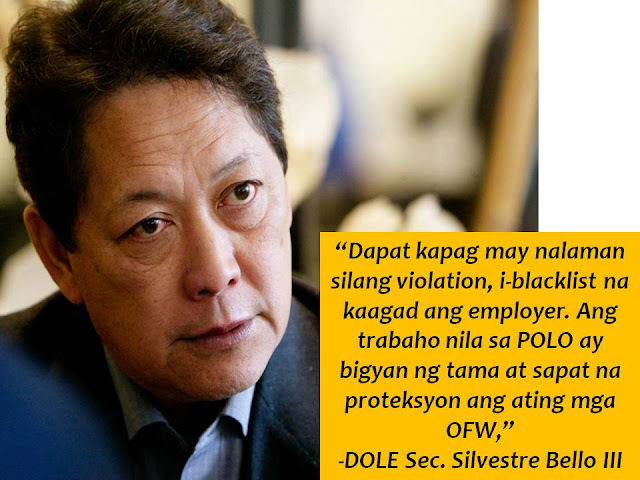 The DOLE Chief stressed out that it is labor attachés to give protection to our OFWs. Bello said that one of the issues reported to him was the violation of the bilateral agreement between the Philippines and receiving countries in the Middle East, particularly on the $400 minimum wage of household service workers, by some employers. 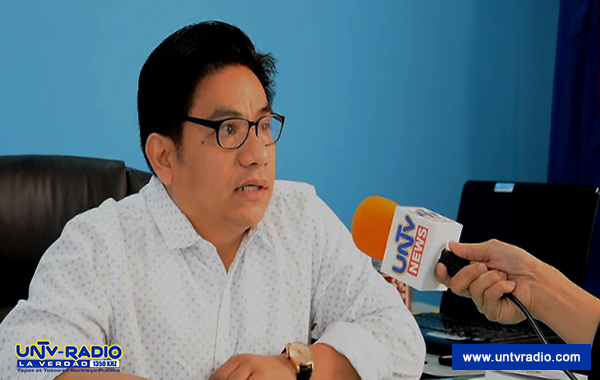 Bello added that if the violation is confirmed, the employer should be immediately blacklisted. Issues of maltreatment of Overseas Filipino Workers (OFWs) especially those who are working as domestic helpers are not new.Recently, a Pinay OFW in Riyadh is asking for help after she suffered maltreatment in her employer at the same time, did not receive a for three months now. As a Filipino that works abroad or OFW, how long would you like to work in other country and be away from your family? Do you have a goal to be able to come back in the Philippines for good, let us say, after 10 years of working?Others may say, this is impossible because of too many spending to meet, especially with a family back home without a stable income. 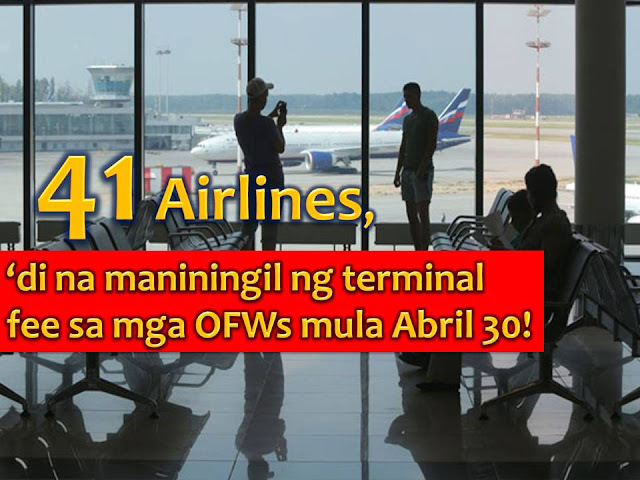 Forty-one airline companies operating in the Philippines have signed a Memorandum of Agreement (MOA) with Manila International Airport Authority (MIAA), Wednesday, March 15, 2017, to totally abolished terminal fees paid by Overseas Filipino Workers (OFWs).Speaking of the event is Transportation Secretary Art Tugade who relay the message of President Rodrigo Duterte to OFWs and also to airline companies.